When you read a book, read an inspiring article, watch an informational video, or just learn something new, it’s a good idea to write down what you’ve learned. Otherwise, you will forget 99% of it. Unfortunately, old-fashioned plain text notes don’t work that great. Such notes are easy to lose and forget about. But most importantly, they are time-consuming to review and you will probably never review them again. Reading “walls of texts” is a pain. Instead of taking notes in the form of “wall of text”, you can open your personal visual knowledge base software, create several objects representing the key things you’ve learned, assign them pictures (so you can see them visually and remember them better), write your related notes and ideas into each of them, then tag and inter-connect them! You can use Mind Collected as a personal learning and memory tool. Compared to other options, it has significant advantages. It’s visual. Every piece of information you capture into Mind Collected is represented by a picture, perhaps a relevant photo that Mind Collected can auto-find on the Internet for you based on the object name. It’s also tag-based, so you can easily organize your information and objects using tags. And it allows you to write rich text notes for each of your objects, including images, tables, hyperlinks and more. You can learn much faster with Mind Collected. By inter-connecting the captured information (which is represented visually), you will create new mental associations. Your brain will automatically start growing new synapses and even neurons. This process is called neuro-plasticity and is fully proven by the discoveries in modern neuro sciences. Our brain learns based on associations. When a new information doesn’t trigger any associations for us, we simply can’t learn it. We can’t understand it and we can’t remember it. It’s just too alien to us. The good news is that with Mind Collected, it’s easy to build new mental associations. You can easily build your own strong map of visual associations, using tags and item connections and hyperlinks. As a result, your brain will be ready to rapidly learn any new related information. In fact, the more items you have in your visual knowledge base, the better: When you then learn something new, you can immediately connect (associate it) with multiple existing entries in your knowledge base …and BAM! – you will remember it forever. Mind Collected allows you to remember better and longer. It makes it easy for you to represent key topics or concepts visually. Our brains are much better at remembering visual information. Your visual cortex is a power-house, and it is severely under-utilized when working with regular plain-text notes. When I read a book, I no longer take the old-fashioned plain text notes (that I would forget about anyway, and that aren’t particularly fun to review or easy to remember). Instead, I add the book into Mind Collected, complete with the cover picture. Then, as I am reading, I will start adding new objects, and connect them with the book and with other objects I already have there. And I will write down any interesting information into the individual objects. (The objects can be based on concepts, topics or key ideas). I will also tag the new objects. This will automatically add them into my existing collections based on tags – this helps me create even more associations. What if you could keep reviewing your notes incidentally, with zero effort on your part? You see, as you keep working with Mind Collected, you will keep seeing the information you’ve captured before, because it is tagged and richly inter connected with other things in your knowledge base. With Mind Collected, it’s almost impossible to forget about the things you’ve captured before – you will just incidentally keep seeing them, again and again. 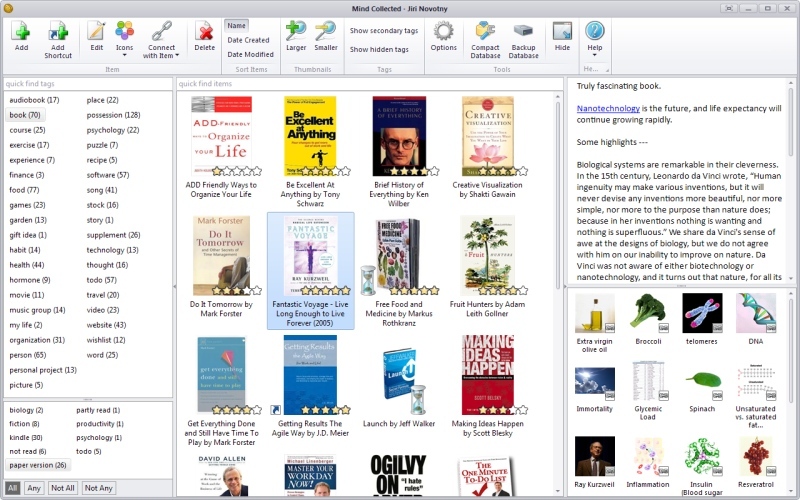 Download free 30-day trial of Mind Collected for Windows and start learning and remembering on a whole new level!